Very often, air assessment is needed to support Focused Feasibility Studies (FFS). These are testing programs that are designed to evaluate different remedial options. The collection of field data representative of the remedial options is the only way that these options can be properly evaluated. The air pathway analysis (APA) for an FFS typically involves assessing the impact to the air quality related to one or more selected site remedial options or activities. 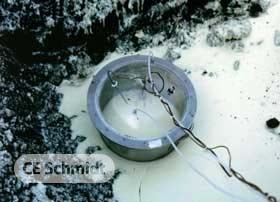 The air pathway must be considered, and for sites that include on-site or in-situ waste handling and treatment, air emissions from these remedial activities can greatly influence the course of the site remediation. Controlling air emissions from these activities can also have a significant impact on the budget. Therefore, it is very important that the candidate air emission control technologies are properly evaluated which leads to a cost-effective remedial plan. 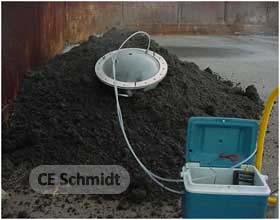 Most of the focused FS work involving air emissions from waste site remediation programs includes: assessing and controlling the air emissions during the waste excavation and handling activities, and assessing the air emissions from the treated waste as an end-product of treatment. 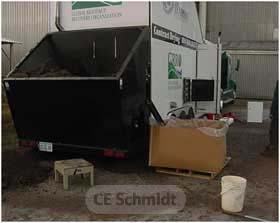 Assessing the disturbed waste air emissions is accomplished typically by measuring emissions immediately after a staged waste disturbance. 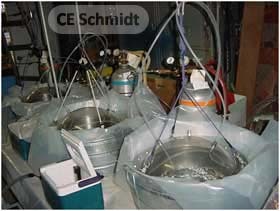 Evaluating air emissions from various emissions control technologies can be accomplished by measuring emissions before and after application on a small scale (photo 1), even in the laboratory (photo 2), or on a larger scale as the program demands (photo 3, 4). 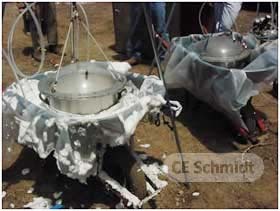 Testing the emissions from processed waste materials using the USEPA flux chamber (photo 5,6) has also proven to be most useful. 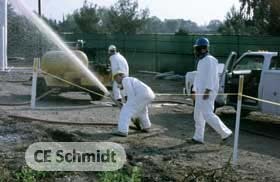 Regardless of the situation, the disturbed air emissions and the efficiency of air emission control technologies, including covers, sprays, foam products, and mechanical gas collection and treatment, are essential for site remediation programs where the waste material can generate unacceptable air emissions during site remediation.